Some time ago I saw a blog posting (I can’t recall where) headlined something like “My first games store was not a games store,” about how you used to be able to find D&D books and figures in department stores like Sears. I distinctly remember my brother & I going to the Sears hardware store with my dad and finding Grenadier AD&D figures on a rack somewhere near the power tools(!? ), which is the only place I’ve EVER seen Grenadier AD&D blisters. A true hobby shop in town also had some D&D stuff very prominently displayed near the front, lots of Heritage Models stuff including pre-painted figures and mini-games with plastics figures based on the lead minis, and most importantly open Grenadier boxes under the counter which they sold for $1 a piece — just the right price point for a kid’s allowance. Yep, there is some awesomeness here indeed. Dark Tower, the game with a commercial narrated by Orson Wells and some of the most amazing art ever, not to mention play that still holds up. (Sadly, this game was quickly pulled, not because it didn’t sell well — it did — but because of an IP lawsuit). 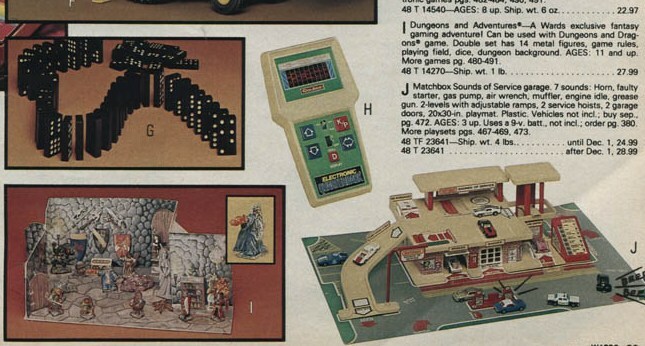 Note also the electronic Dungeons & Dragons game. I still have working copy but I don’t know if I EVER played the game through to the end, it was very abstract. Anyway note the Heritage sets on the bottom of the page. 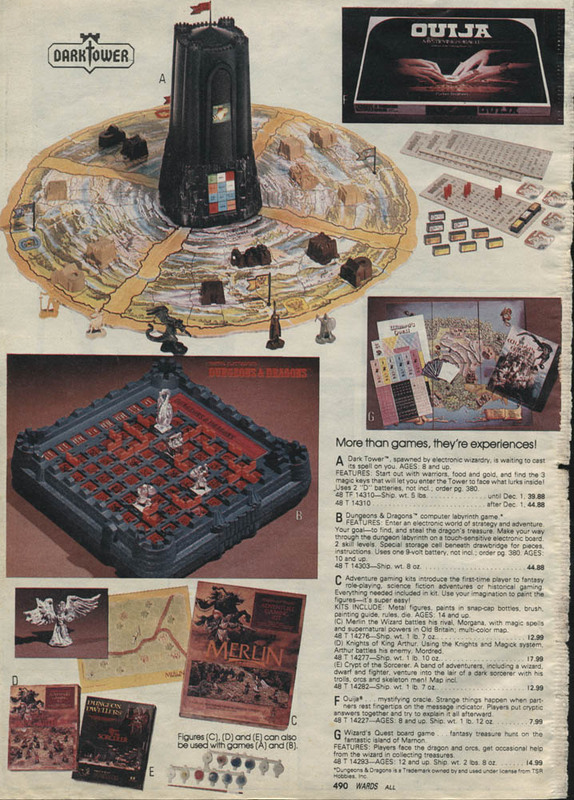 (They helpfully note the figures can be used with Dark Tower and the electronic game too! I suppose that is true, in a way, but I never did.) I notice the Caverns of Doom aren’t mentioned, but I think they were released just after the Crypt of the Sorcerer. I love that they share the page with a Ouija board! At $27.99 that was quite a pricey set. 14 figures are mentioned, but no paints. Some of the figures are recognizable, particularly the Crypt sorcerer in the inset. Rules are mentioned too, but no map, so I can’t say whether this would be some other Heritage rule set or what. We laugh and squirt water! 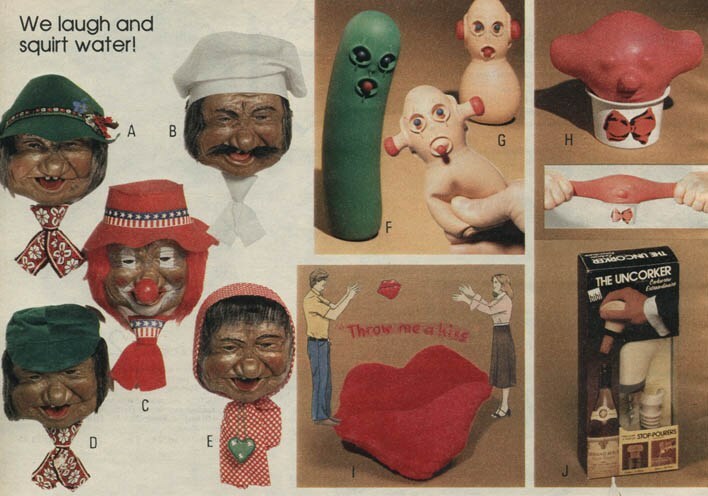 We laugh and float, disembodied, down the hall and creep into your room while you sleep! You’ll notice they all have the same horrific cretin/Baba Yaga face, with different costumes. WTF? I thought you might be interested to know that the Heritage ‘diorama’ (separate from the Paint-n-Play products) shown in the Wishbook page 23 is the “Giant’s Cave” from a series of cardboard dungeon environment and floor tiles paper stock products Heritage released. Feel free to drop me a line if you’d like a copy of it.